Glencoe Speech is an introductory speech text for high school students. The text covers the full range of speech topics, from different types of interpersonal communication to preparing and presenting speeches to debate and parliamentary procedure, making it a good fit for all introductory speech classes. Glencoe Speech is authored by three leading high school speech teachers and debate coaches - Randall McCutcheon, James Shaeffer, and Joe Wycoff - and provides you with the most effective techniques and strategies for teaching speech/communication. Features include interviews with real people from a variety of occupations who describe how communication is involved in day to day activities. 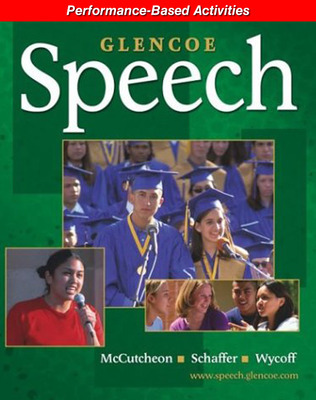 Glencoe Speech is an ideal text for both college prep and students making their way into the world of work.